The self-proclaimed “Mistress of Evil” evokes a myriad of emotions from different people. Some love her while others do not. One thing is for sure, from the moment she first appeared—55 years ago—she captured imaginations and staked her claim as one of Disney’s iconic characters. Whether it is Halloween, a cosplay event or a costume themed party; you are bound to find at least one person in a Maleficent costume. If you are shopping for a Maleficent costume, then you need to consider design, number of pieces and quality. 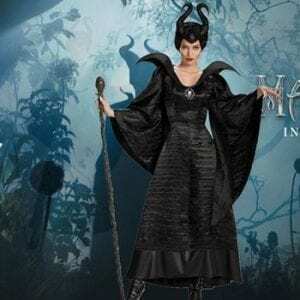 To help you purchase the best costume, here is a review of the top five Maleficent costumes. 6 5. 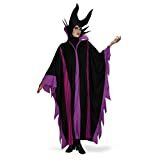 Adult Deluxe Maleficent Christening Black Gown Costume — The Most Popular Maleficent Costume. 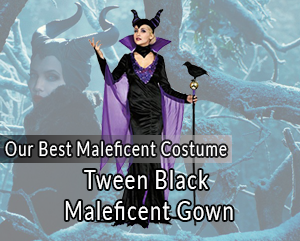 The Tween Black Maleficent Gown costume is a gripping reimagining of the original costume. It is designed with teenagers in mind, and for that reason, it incorporates details that teenagers are bound to find fresh and fashionable. 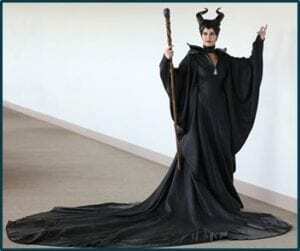 For example, while the original Maleficent gown is long; this costume is short. The costume consists of three pieces. A dress, a headband with horns and a brooch. The velvet dress has a v-neckline with lace sleeves and a skirt overlay. The lace sleeves are an added detail meant to inject youth into the costume so that it can appeal to teenagers. The dress’ foam collar has extended wings on each side that mirror those observed in the original costume. The plastic brooch fastens to the neckline with a Velcro dot. The last piece in this costume is the plastic headband with molded vinyl horns on top. While plastic can be oft times uncomfortable, this particular plastic headband is designed for comfortability and flexibility. As a result, one can spend hours in the costume. The only missing piece is Maleficent staff. The staff is available separately at an affordable price. Also, you will need to find the right shoes for this costume. Detailed or bejeweled knee-high black boots are a particular favorite because they pair well with the costume. With the boots and staff in place, you will be able to make your entrance as the stylish, mystical and mysterious Maleficent. It is essential to note that while the costume allows one to embody the evil Maleficent in full, the lace details inject an element of cuteness and fun which is always a plus. The costume is available in all the standard sizes for young girls and teenagers. The fabric used for the costume is 100% polyester velvet and lace and 100% polyurethane foam. Consequently, the costume is durable and can be worn for a long time before it falls apart. Purchasing coordinating shoes adds an extra cost. Over the years, Maleficent has captured the imagination of countless girls across the globe. Young girls love that Maleficent is strong, powerful and that she stands up for herself. With this in mind, the Girls Deluxe Black Maleficent Christening Gown costume is designed for young girls aged between 6-12 with the aim of making them feel as strong and powerful as Maleficent. The costume draws its inspiration from the movies. It attempts to replicate Maleficent’s original gown, and the result is a versatile costume that is dark enough for Halloween and detailed enough for cosplay and costume themed parties. The costume is made up of three pieces—a dress, a brooch and a horned headband. The black satin gown has an elastic waistband to give the dress form and shape. A foam collar with extended wings is attached at the neck, and it mirrors the wings on Maleficent original costume. The silver plastic brooch attaches to the neckline with Velcro for efficiency and the plastic headband with molded horns in front completes the look. A great plus of purchasing the Girls Deluxe Black Maleficent Christening gown is that though it is pocket-friendly; it is designed to look high end and top of the line. The sizing chart offers two options: the 7/8 and 10/12. The 7/8 sizes are perfect for children aged six to nine. The 10/12 sizes, on the other, cater to children aged ten to thirteen. The costume does not come with shoes or the Maleficent’s staff. Any black shoes or boots will pair well with the costume although you can also choose to purchase shoes designed to resemble those that Maleficent wore. Either way, the costume still works. The staff is available separately at an affordable price. The designers used 100% polyester when making the costume, and as a result, the costume is durable and of high quality. The costume is comfortable and flexible. An extra cost is incurred when purchasing accessories such as gloves and coordinating shoes. Just because it is a costume does not mean it cannot be stylish and fashionable. That was the reasoning behind the Women’s Disney Maleficent costume. Designers of the costume created it with one goal in mind—to make it a show stopper. Numerous elements make this garment show-stopping. First, the dress part of the costume incorporates a high purple collar that not only telegraphs power but is also fashionable. Second, the gown has a long slit down center uncommon in other Maleficent costumes. Third, the gown’s neckline has a jeweled purple detail at the front meant to not only draw one’s eye towards it but also improve on Maleficent traditional brooch. Finally, the gown also incorporates a purple sequin inset. The juxtaposition between the black and the purple is both contemporary and pleasing to the eye. Other added elements include a choker necklace and black mesh that hangs from the dress’ sleeves. The choker, in particular, adds a dash of danger. The headpiece complete with horns ties the look together. While one would tend to think the incorporation of color in the costume would make it less sinister or villainous; that is not so. Instead, this Women’s Disney Maleficent costume manages to be both dark and stylish. Purchasing this costume guarantees one thing; heads will always turn in your direction. Moreover, the material used to make the costume is thick and of high quality. That means you can wear this costume to multiple events over a considerable period without the gown falling apart. One should note that shoes and the Maleficent staff come as separate pieces. However, when it comes to shoes, this particular costume accommodates a wide variety of shoes including heels, flats and boots. The costume is available in the standard adult sizes—small, medium, large and extra-large. The costume is comfortable and stylish. The costume is durable and of high quality. The costume is a bit pricey because of all the added details. The first thing that stands out from this costume is the fact that it is made from spandex. Though this Adult Deluxe Maleficent Costume incorporates polyester as well, the gown which is the central piece is made from spandex. The use of spandex gives the costume a superhero feel even though Maleficent is not a hero. However, spandex is also associated with strength and power, qualities Maleficent has in spades. The costume is made up of only two pieces—the dress and the headpiece. Its uniqueness arises from the numerous details integrated into the dress. For one, the dress has a dramatic upturned collar with a purple inset. Next, the dress has a deep V-neck that adds an element of style. Mesh undersleeves are attached to the sides of the dress to give it character while a sheer black cape attached to the sleeves give the gown an element of mystery and magic. The final detail that completes the gown is the asymmetrical hemline. Shoes are not part of the costume, but it is advisable to get black boots because they pair well with the costume. The staff is also not part of the costume, but it is available as a separate piece at an affordable price. Overall, this is the least dark or ominous among the Maleficent costumes. The horns and the staff make it certain you are embodying a villain, but the design gives the costume a lighter demeanor. The costume is available in all the standard adult sizes—small, medium, large and extra-large. Quality of the material used is high quality, and as a result, the costume is durable. The costume is unique which makes it possible for the wearer to stand out at any event. Shoes incur an added cost. 5. Adult Deluxe Maleficent Christening Black Gown Costume — The Most Popular Maleficent Costume. The Adult Deluxe Maleficent Black Gown costume is the adult version of the Girls Deluxe Christening Gown discussed above. It integrates a simple design that attempts to duplicate the original costume from the movies closely. It consists of three pieces—the dress, the headpiece and the brooch. The dress is a black gown that fastens at the back with Velcro. It has a full collar and draped sleeves which give it character. The horned headpiece completes the look and transforms the wearer into a dark, villainous Maleficent. Though there isn’t much going on with this costume in terms details and unique features, it is one of the most popular costume because of three things: it perfectly embodies the character, it is durable thanks to the high-quality material used, and above all else, it is pocket-friendly. If you feel the costume is not elaborate enough, then you are at liberty to add accessories that will complement the costume. Accessories you can add include gloves, makeup and a neck piece. Shoes are not part of the costume, and neither is the Maleficent staff. The staff is available for purchase as a separate piece. If you happen to have black shoes that go well with the costume, then you can wear those to complete the look instead of purchasing new shoes. Once again, this costume is available in all the standard adult sizes—small, medium, large and extra-large. The costume is not detailed. You now know the best Maleficent costumes in the market today. Before proceeding to purchase, there are some things you ought to consider. While it is possible to add as many accessories as you wish to your Maleficent costume, it is important to understand the three signature pieces that must be part of any Maleficent costume. Understanding these pieces will help you make the right decision when shopping for a costume because you will be able to determine a complete versus incomplete costume. Before the 2014 movie—Maleficent, the sleeping beauty movie introduced the Maleficent character 55 years ago. Since then, the Maleficent costume has remained unchanged, and three signature pieces have stood the test of time. A Maleficent costume must consist of a gown, a brooch and a horned headpiece. The gown is usually black, and the brooch is attached at the neck. When shopping for a Maleficent costume, check to ensure these three pieces are available. Once that is done, you can then have a look at the extra pieces the costume offers. When people think of Maleficent, the first thing that comes to mind is a ruby lip, high cheekbones and eyes rimmed in black. The make-up is just as important as the gown itself. Therefore, while makeup is not sold as part of the costume, it is essential that you include it in your budget. Having the right makeup is the only way to embrace and portray Maleficent. Maleficent has always been a glamorous villain, and part of that glamor comes from the fact that her costumes fit her to a tee. It is therefore essential to get fitting right when it comes to purchasing the costume. Most outlets have a detailed size guide to help you find the right costume. Go through the guide, compare the size chart with your measurements and only then can you be in a position to order a fitting costume. Note that the measurements are not just for the gown, but also for the headpiece. The above guide has covered several Maleficent costumes as a way of ensuring you are exposed to the key options in the market today. If you are searching for a costume for your daughter, then the guide has you covered. If instead, you desire a fashionable costume for yourself, then the guide has you covered as well. You should thus be in a position to purchase the best possible costume.